UNIVERSITY PARK, Pa. -- A new use for glass is being developed by researchers in Penn State’s Materials Research Institute that could make future hybrid-electric and plug-in electric vehicles more affordable and reliable. flexible glass for energy storage. Thin and flexible glass for displays is already a widely commercialized technology. But even thinner glass, about one-tenth the thickness of display glass, can be customized to store energy at high temperatures and for high power applications, such as electric vehicle power electronics, wind turbine generators, grid-tied photovoltaics, aerospace, and geothermal exploration and drilling. In a recent paper in the journal Energy Technology, postdoctoral researcher and lead author Mohan Manoharan and colleagues report on experiments with various alkali-free glass compositions and thicknesses, comparing their energy density and power density to commercial polymer capacitors currently used in electric vehicles to convert energy from the battery to the electric motor. Because polymer capacitors are designed to operate at lower temperatures, they require a separate cooling system and a larger safety factor, which adds to their bulk. 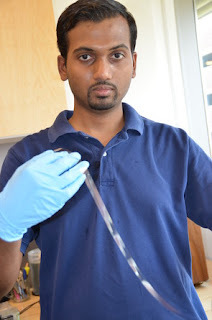 In his research, Manoharan identified 10-micron thick glass from Nippon Electric Glass (NEG) as having an ideal combination of high energy density and power density, with high charge-discharge efficiency at temperatures up to 180 C and, in more recent experiments, even higher. Partnering with NEG leverages the investment of leading glass manufacturers in developing the processes to create continuous sheets of glass with less thickness and fewer defects. Working with State College-based Strategic Polymer Sciences, the researchers are developing the capability to produce inexpensive roll-to-roll glass capacitors with high energy density (35 J/cc3) and high reliability. In work funded by the Department of Energy, Manoharan and the Penn State team led by Michael Lanagan, professor of engineering science and mechanics, are collaborating with Strategic Polymer Sciences to coat the glass with high temperature polymers that increase energy density by 2.25 times compared to untreated glass, and also significantly increase self-healing capabilities. Self-healing or graceful failure is an important consideration in applications where reliability is a critical factor. Co-authors on the article, “Flexible Glass for High Temperature Energy Storage Capacitors,” are Chen Zou, Nanyan Zhang, Douglas Kushner, and Shihai Zhang, all of Strategic Polymer Sciences; Takashi Murata of Nippon Electric Glass; and Manoharan, Eugene Furman and Lanagan of the Materials Research Institute at Penn State. Toyota Motor Corporation has announced that it has developed a vehicle to home (V2H) system for the mutual sharing of power between electric-powered vehicles, such as plug-in hybrid vehicles (PHVs) and electric vehicles (EVs), and homes. The V2H system is to start testing, using Prius PHVs, at the end of 2012 in approximately ten households as part of the Toyota City Low-Carbon Verification Project2 (Toyota City Project) that began in April 2010. The newly developed V2H two-way electric power supply system can supply power from home to vehicle as well as from vehicle to home. An AC100 V inverter onboard the Prius PHV converts stored power into AC suitable for home use, while power flow is controlled according to communication between vehicle, charging stand and the home. With this new method, low-carbon electricity ("green" electricity) generated from regional or home solar generators, or low-cost late night electricity, can be stored in a vehicle's drive battery and then used to supply power to the household during peak consumption times. This kind of optimal energy flow can be automatically controlled by a home energy management system (HEMS). Vehicle batteries can also be used as a power source in times of emergency by manually setting the electricity flow to supply power from the vehicle's drive battery through the charging stand to a home's lights and power outlets. With a fully charged battery and full tank of gasoline, a Prius PHV can supply power for average Japanese household electricity use (approximately 10 kWh) for four days. 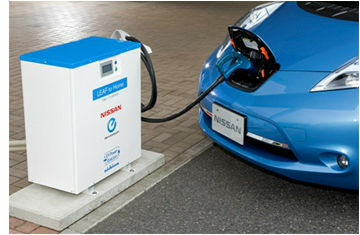 System With "EV Power Station"
Nissan Motor Co., Ltd. will launch the "LEAF to Home" power supply system at its dealerships in Japan in mid-June 2012. The V2H system (Vehicle to Home) can supply electricity from batteries onboard in Nissan LEAF electric vehicles (EV) to homes when used with the "EV Power Station" unit developed by Nichicon Corporation. "LEAF to Home" is an industry-first backup power supply system that can transmit the electricity stored in the large-capacity batteries of Nissan LEAFs to a residential home. Nissan will showcase this system at its Japanese dealership showrooms beginning in June to help promote efficient electricity management and demonstrate the features built into electric vehicles. Nichicon, an innovator in power supply systems, will provide the technology to move the electricity from vehicle to home through its "EV Power Station" units. This power transfer system enables electricity stored in high-capacity lithium-ion batteries onboard a Nissan LEAF to be sent to an ordinary home by connecting the car to the home's electricity distribution panel with a connector linked to the LEAF's quick charging port. The EV Power Station system is similar in size to an external air-conditioning unit, can be installed outdoors, and conforms to the CHAdeMO protocol for EV quick chargers. CHAdeMO is an abbreviation of "Charge de Move" ("charge for moving") and is the trade name for a quick-charging method used to charge the batteries of electric vehicles. The Nichicon system's connector complies with the JEVS G 105 standard defined by the Japan Automotive Research Institute (JARI). This system can run on various operating modes and has a timer function which can be controlled with a liquid crystal display (LCD) touch panel. Electricity is stored or supplied automatically in accordance with a household's electricity capacity and consumption. The EV Power Station can fully charge a LEAF in as little as four hours, which is approximately half the time required when a normal charger is used. All current Nissan LEAF owners in Japan will be able to use the system, depending on their home's installation requirements. With Japanese government subsidies taken into account, the EV Power Station is estimated to cost 330,000 yen ($4200), which amount includes 10% consumption tax and installation charge. 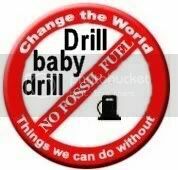 Alternatives to fossil fuel are available that are superior in many respects. Not only are they better for the environment, they are better for our health, they are cheaper, more efficient, better for our balance of payments, they can decentralize things, making things less vulnerable to failure and attack, and they can create many clean local job and investment opportunities, avoiding military conflicts over fossil fuel, etc. Nations around the world are competing to facilitate the shift to a clean economy. Many believe that China, with its huge and cheap workforce, is in the best position to do so. Nations like Germany, Japan and South Korea count on the strength of their export industries. What chances does America have? 4. The American market has plenty of scope for electrification. America is fortunate to have good domestic opportunities for solar power, unlike countries like Japan, Germany and South Korea, where the sun doesn't shine as brightly and where the solar industry needs more government support. 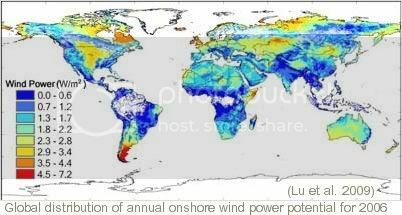 America also has good wind and geothermal energy available, allowing a clean energy mix to be built that can power the entire continent, provided sufficient support is given to such facilities, as well as electricity transmission capacity, smart meters, electric vehicles for storage and V2G, etc. The size of its skilled workforce and its industrial output combine with a huge spending power by consumers, making America the biggest and most innovative market in the world. America has numerous innovative industries that can be flexible and mobile if needed. This puts America in an ideal position to shift to a clean energy economy, with all its benefits including the numerous domestic job and investment opportunities. America is the biggest economy in the world and is open and attractive for investers from around the world. America has a history of accommodating innovative industries, while American industries are also good at outsourcing activities abroad. 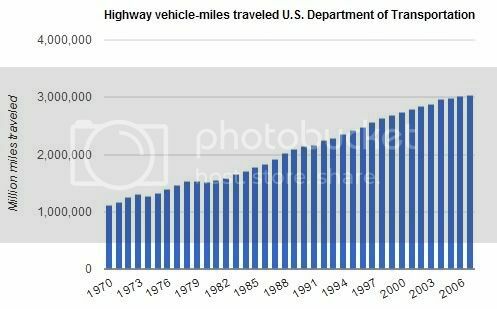 Americans have a long history of driving cars. Vehicles are ingrained in society. Given the many benefits of electric vehicles, Americans - of all people - will be the first to embrace them. Fumes from smokestacks and tailpipes are a major health hazard. Electric vehicles are an essential element of a sustainable economy, both in terms of financial health, personal health and environment health. The arguments in favor of electrifying transport and producing clean energy are overwhelming. Earlier, a studyconcluded that the vehicle sector caused $56 billion in health and other non-climate-change damages in America in 2005. The EPA released a report showing that its programs to reduce air pollution from smokestacks and tailpipes will save America some $2.0 trillion in 2020, preventing over 230,000 early deaths, at a compliance cost of a $65 billion. We're not even talking about CO2 yet, just about short-lived pollutants such as soot and precursors to ozone, which have a dramatic impact on global warming as well. Measures to reduce such pollutants, as proposed in a recent UNEP report, could reduce warming in the Arctic in the next 30 years by two-thirds, as well as avoid 2.4 million premature deaths and result in 1% to 4% higher crop yield. America is the largest largest vehicle market in the world. Of the 204 million personal vehicles, the average American household owns 1.9 vehicles, which is slightly more than the average number of drivers per household. The fact that so many American households have a second car makes it easy for them to swap one of them for an all-electric car and use it mostly for urban commuting, shopping, etc. 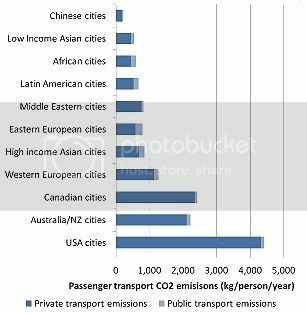 As shown on the chart left, based on UITP data, passenger transport emits far more CO2 in US cities than in cities elsewhere. This means that electrification of vehicles in America will have more impact on the environment than anywhere else. Oil is mostly uses to power transport, as the barrel image left shows. Apart from the fuel used to directly power transport, motor oil and lubricants are used that are also made from oil, while oil is also used for drilling and pumping at the wells. 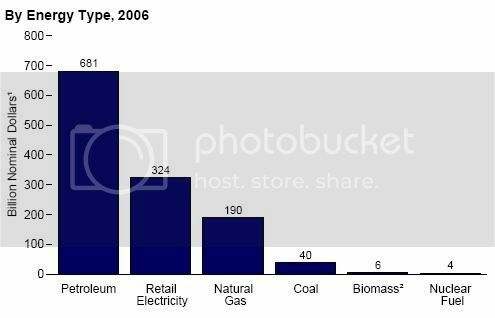 The image below further shows that Americans spend far more money on petroleum products than on any other forms of energy. This means that - compared to other forms of energy - there is much more scope for savings to be made by shifting away from oil, as well as more scope for fees to be raised on the transport-related pollution associated with oil, especially in America. Accordingly, there is much more scope to use the revenues of such fees for transport electrification in American cities, compared to cities elsewhere in the world. Thus, transport electrification has the potential to take place much more rapidly in America than anywhere else. Prices of gasoline are relatively low in America. Gas prices (including taxes) have historically been more than $1 per gallon more expensive in Canada. 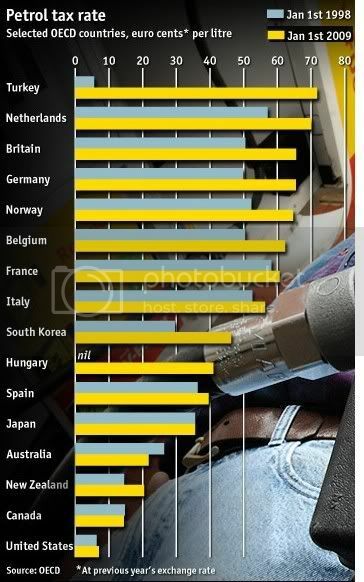 In Europe, the average retail price of premium gasoline is more than double the price in America. 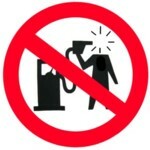 Extra fees on petroleum products therefore won't rock the boat in America. 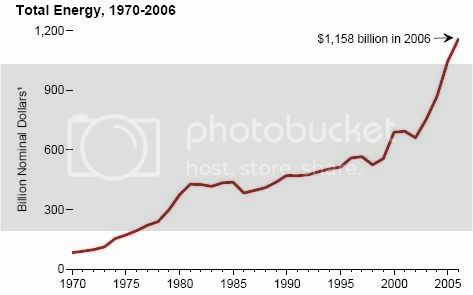 As the image below shows, the amount of money people are paying in America for energy is rising, proving there is plenty of elasticity in the price of energy. Using the revenues of fees to help local transport electrification programs could thus be more effective in America than anywhere else; American cities would get far more value-for-money, compared to similar programs in cities elsewhere in the world. Much of the increased spending on energy over the past few decades is caused by higher gasoline prices. Powering vehicles by electricity is much cheaper than by gasoline. Americans may have a lot of money to spend, but they are also keen to have the best deal. 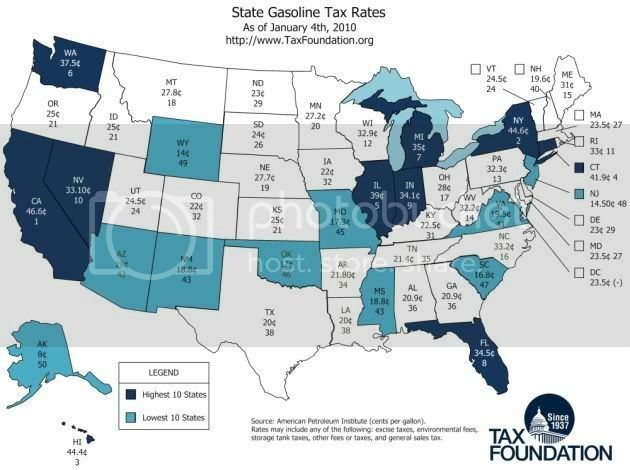 While there already are state and federal taxes on transport fuels in America, such taxes are low compared to elsewhere in the world, as shown on the image left. In January 2011, motor gasoline taxes averaged 48.1 cents per gallon and diesel fuel taxes averaged 53.1 cents per gallon, according to NACSonline. In other words, the American situation offers plenty of scope to raise funding for transport electrification. Such funding could lower the price of electric vehicle more rapidly in America than anywhere else. This will in turn revitalize the American vehicle industry, with plenty of good job and investment opportunities and scope for exports. Other countries have already raised taxes on petrol and on sales and registration of vehicles to much higher levels; they have already used the revenues for all kinds of purposes. In America, it's therefore easier to add further fees on petrol and on vehicles, in order to raise funding for transport electrification. Both nuclear and coal-fired power plants in America are old and due to be replaced, so they might as well be replaced by cleaner facilities. Amory Lovins wrote in 2009 that of all 132 U.S. nuclear plants built (52% of the 253 originally ordered), 21% were permanently and prematurely closed due to reliability or cost problems, while another 27% have completely failed for a year or more at least once. The surviving U.S. nuclear plants produce ~90% of their full-time full-load potential, but even they are not fully dependable. Even reliably operating nuclear plants must shut down, on average, for 39 days every 17 months for refueling and maintenance, and unexpected failures do occur too. As a recent study points out, the mean age of power plants operating in China is 12 years. In America, the mean age of power plants is 32 years, in Japan it's 21 years and in Europe it's 27 years. This makes it harder for China than for America to decommission all their coal-fired power plants. Few new coal-fired power plants have been built in America over the past few years anyway, while many older power plants should have been decommissioned years ago. As Joshua Frank wrote at the close of 2010: In the last 25 months not one coal-fired power plant broke ground for construction in the United States. In 2010 alone a total of 38 proposed plants were erased from the drawing board, the most ever recorded in a single year. Utilities also announced 12,000 MW in coal plant retirements. Similarly, the electric grid is unreliable, inefficient and prone to black-outs and glitches. Upgrading the grid should go hand in hand with a shift to electric vehicles and genuinely clean energy (such from solar, wind, wave and geothermal facilities). In the light of the EPA announcement of CO2 emission standards for fossil fuel power plants, it's a good time to shift to genuinely clean alternatives. As said, the EPA has announced it will act on emissions from fossil fuel power plants and petroleum refineriesand this can act as a catalyst. Standards are not the most efficient way to facilitate the shift to clean energy. Standards encourage small incremental changes within obsolete technologies, rather than the more radical switches to the clean technologies that are needed instead. The looming prospect of EPA standards can make politicians consider feebates, as the most effective way to facilitate the necessary shift to clean energy. In the past, politicians have tried to introduce a carbon tax in America. Politicians have also tried to introduce a national cap-and-trade system. Each time, politicians failed to fully integrate a rapid transition to electrified transport. Combining fees and rebates is the way to achieve this. Fees on polluting cars and on fossil fuel will benefit the competitive position for the clean industries that are needed instead. Moreover, when the revenues of such fees are subsequently used to fund rebates on clean alternatives, those clean industries will benefit twice. That is the way to give America the much needed clean job and investment opportunities. It is the fastest track to electrified transport, with all the benefits for consumers and the people at large. Indeed, the most effective way to shift to a sustainable economy is by imposing fees on polluting products, and then each time spending the revenues of such fees on the better local alternatives, such as transport electrification and producing energy with facilities such as wind turbines, solar panels, etc. While the EPA does have an important role in setting standards, such standards lack the financial clout and thus effectiveness of feebates to facilitate the much-needed shifts. Politicians care about effectiveness and should therefore look at feebates. It is sad that America has not implemented carbon-reduction policies, but on the other hand this also means that America isn't locked into specific policies yet and can therefore embrace feebates without reservations. Now is the time for comprehensive climate and energy policy. In the past, a country's economic success was decided by factors such as population size, cost of labor, access to resources and an educated workforce. But in the race for clean technologies, effectiveness in policy is the key. The Recovery Act has provided the necessary traction to revive the economy, further helped by the Tax Package. Importantly, these are short-term policies, focused on dealing with economic recession. Precisely because it isn't locked into specific policies for years to come, America can now adopt the necessary longer-term feebate policies that will both generate economic success and reductions in greenhouse gas emissions. America has a lot of elasticity in taxes on products and on income. According to OECD data, tax revenue in America was only 28% of GDP in 2008, compared to a 34.8% average for the OECD. In most countries, governments have already imposed high consumption taxes on the price of cars and gasoline, making it harder for them to raise prices further. 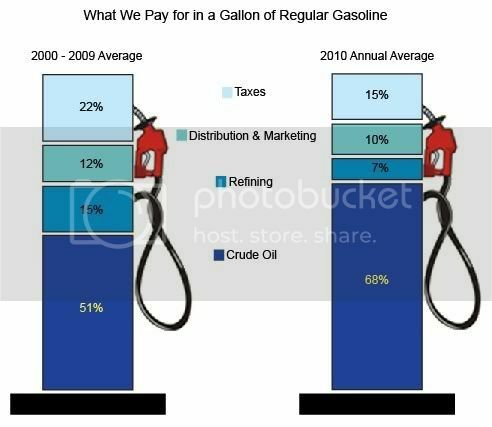 Americans are thus in a better position to increase prices without too much hardship, which became evident when gas prices went up significantly in the past. In America, there's more scope for the prices of polluting cars and fossil fuel to rise, before even reaching levels already common abroad. Thus, the American economy can remain competitive, even with higher taxes. Of course, while America has plenty of scope for higher taxes, Americans dislike both taxes and government running businesses. This situation actually puts America in a good position to adopt the more effective policies of local feebates, i.e. fees on fossil fuel each time funding local rebates on clean energy and transport electrification programs. East Asian and West European countries, who have to import much of their energy, are well aware of the economic potential and importance of clean energy. Rather than sending money abroad to buy fossil fuel or pouring it into associated moribund industries, they are investing heavily into the clean industries of the future, using the revenues from their already substantial exports, as well as the revenues of their higher taxes on cars, gasoline, etc. Such countries typically have higher taxes, while using the revenues to subsidize selected industries and products, a policy sometimes referred to as 'dirigism' or 'picking winners'. In many respects, their policies are fixed for years to come. As said, Americans dislike such policies. However, not acting on climate change isn't an option. Industries will be hesitant to make investments, as long as America remains hesitant about directions for the future. This is only ameliorated by the Financial Crisis that has put many investments in America on hold. Many other countries have already shifted significantly to consumption taxes. So, compared to many other countries, America has more scope to make a similar shift. Consumption taxes work better than income taxes, as consumption taxes reward productivity and success, rather than hold them back. Consumption taxes also create less of a black economy. Consumption taxes can be very effective in raising revenue and in facilitating change. Feebates are more effective than raising income taxes to finance further tax credits and subsidies. Compared to most other countries, America is in a better position to introduce feebates. The size of the American debts and its budget deficits make it imperative to consider feebates, which can be budget-neutral, so they won't increase national debts or compromise scheduled budgets. Therefore, this makes it even more easy for America to choose for feebates, the most effective policies. 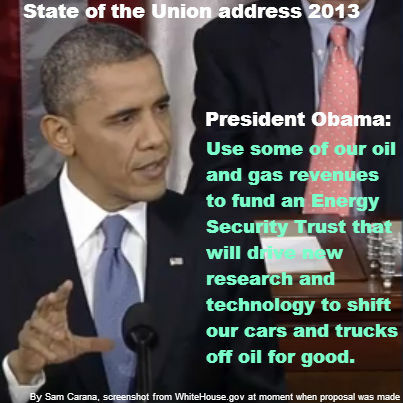 Oil is the key cause of the U.S.'s financial predicament. The late-2000s recession came about when, in early 2008, oil prices surpassed $100 a barrel for the first time and a gallon of gas cost more than $4 across most of the U.S.A. The economic contraction in late 2008 caused a dramatic drop in demand and oil prices fell accordingly. 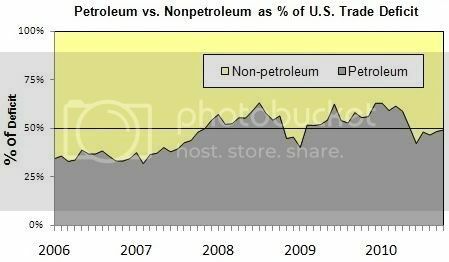 As above image shows, oil imports are responsible for a large part of the American trade deficit. There's a huge additional military cost to secure oil supply from areas such as the Gulf. 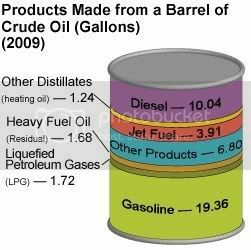 Most oil is used for transport, causing huge amounts of pollution, in turn causing health problems, climate change, etc. 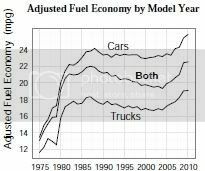 Efforts to increase fuel economy make only little difference, as the image on the left shows, as people buy more SUVs and travel more, as illustrated by the image below. To reduce the trade deficit and pollution (such as CO2 emissions) transport needs to go electric. 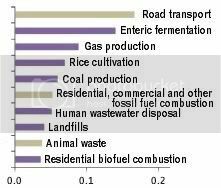 Transportation causes huge amounts of greenhouse gas emissions, constituting a growing part of total emissions, as the image below shows. In California, transportation fuels are responsible for over 40% of annual greenhouse gas emissions (2005 data). 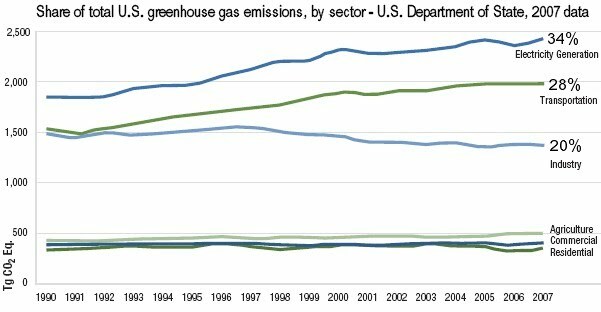 As above image shows, transportation caused 28% of American greenhouse gas emissions in 2007. 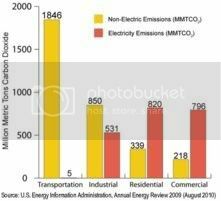 Moreover, if electricity consumption is distributed over sectors, as on the image on the left, the transportation sector dominates carbon dioxide emissions. A shift to EVs is imperative to achieve the much-needed reductions in tailpipe emissions. Additionally, as fossil fuel gets used less, there will also be less emissions caused by mining and drilling for fossil fuel and by transport and distribution of fossil fuel. There will also be less need for America to maintain a global military presence to secure oil supply from sometimes politically-volatile regions. Even when taking into account all pollutants over a 20-year period, road transport tops the list in terms of radiative forcing, as illustrated by the image on the left. Furthermore, EVs can store surplus power generated by wind turbines at times when there's little or no demand on the grid, and then feed their surplus power back into the grid at times of peak demand. In this way, EVs increase the potential for wind energy, which already is one of the most economic ways to generate electricity. Meanwhile, prices of gasoline are rising again, as the world gets out of recession and demand for oil rises. The price of crude oil has again risen to over $100 a barrel. The price of gasoline is rising accordingly, as the American dollar devalues further and due to uncertainties in the Middle East. While the price of oil is more volatile than gas prices, above chart shows that - over the past couple of years - the price of oil has risen even faster than gas prices, promising even higher gas prices in future. 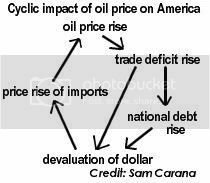 Pressure by oil imports on trade deficits and national debt is pushing the value of the dollar further down, causing further rises in the price of imported oil, in a vicious cycle as pictured above. Gas prices have risen despite the financial support oil has received. This support has only grown during the Obama administration. 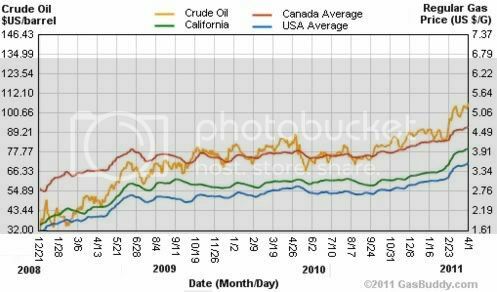 The price of crude oil has risen even faster than gas prices, as further illustrated by above EIA image, which also shows that the tax component of gas prices was only 15% in 2010, compared to 22% for 2000-2009. This because fuel taxes are imposed as a fixed amount in cents per gallon, rather than a percentage of the sales price. As President Obama, in Blueprint for a Secure Energy Future, said: "last year, America produced more oil than we had in the last seven years". 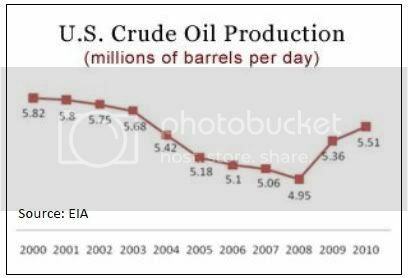 As also illustrated by above chart, EIA figures show that in 2009, the U.S. produced 5.4 million barrels per day (Mbd) of petroleum and consumed 18.8 Mbd of petroleum products. To achieve this outcome, domestic oil production has been subsidized for years and Republicans reject budget cuts that would end such subsidies. An increasing part (currently more than half) of the oil cosumed in the U.S. is imported. Such imports have risen significantly over the past few decades, as shown by the image below. As above EIA image shows, domestic U.S. oil production has declined over the longer term, from close to 9 Mbd in the mid 1980s to the current 5.4 Mbd, and the U.S. is now importing more than half its oil, according toEIA figures. In the light of rising crude oil prices, continuing to import such large amounts of oil would be disastrous for the vulnerable U.S. economy. As President Obama says, while "America uses 25% of the world’s oil, we currently have only about 2% of the world’s oil reserves. Even if we used every last drop of all the oil we have, it wouldn’t be enough to meet our long-term energy needs". Moreover, of course, all this support for oil is out of line with the damage it causes, as shown by incidents such as the Deepwater Horizon oil spill and the mountain of evidence on oil's impact on health, the environment and climate change. Instead, fees should be imposed on fossil fuel, with revenues used for local programs that support (genuinely) clean energy and transport electrification. Such fees are best imposed as a percentage of the sales price where the fuel is burned. Republicans will likely be pushing for more oil drilling, in a repeat of the failed political stunt that marked their 2008 election campaign. Energy Secretary Steven Chu makes more sense; while he agrees that oil prices in the mid- and long-term future will be higher, he said on Jan 4, 2011, that the U.S. should use the oil we need as efficiently as possible, and also to begin to transition away from oil. For example, electrification of vehicles and things like that. 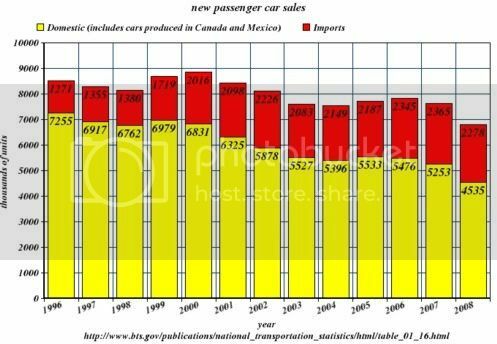 Apart from oil, imported vehicles further contribute to the trade deficit, as illustrated by the graph below. As said before, East Asian and West European countries, who have to import much of their energy, are well aware of the economic potential and importance of clean energy. Rather than sending money abroad to buy fossil fuel or pouring it into associated moribund industries, they are investing heavily into the clean industries of the future, using the revenues from their already substantial exports, as well as the revenues of their higher taxes on cars, gasoline, etc. Electrification of transport can create many domestic job and investment opportunities, reduce trade and budget deficits, improve health, bring troops back from overseas, help with climate change, save the American car industry and the many industries and jobs that depend on them, etc, etc. Traffic convenience, the future of American industries, energy independence, the electric grid, clean local job and investment opportunities, they each benefit from transport electrification. Combined, they make a rapid shift to electric transport imperative. Americans like to do the right thing. They don't like the kind of deceit that is being spread by climate denialists. Increasingly, Americans will demand more effective policies, not only because it's imperative to adopt them for the benefit of America, but also because they benefit all Americans and the world at large. Americans also like to do things right. Feebates have been considered in America for many years and, where implemented, have proven to be the most effective policy instrument to achieve the necessary shifts. Americans also understand the power of market economics. Local feebates work better in ways that Americans appreciate, i.e. they optimize market mechanisms and consumer choice, and give local skills and enterprise a go as to what's best produced and sold in their area. Money now wasted on fossil fuel constitutes a huge burden on society, dragging down the economy by stopping development of clean products that would otherwise create numerous domestic job and investment opportunities, improve our balance of payments, improve energy independence and security, improve transport and grid efficiency, reliability and convenience, etc, etc. The currently-externalized cost of fossil fuel constitutes a huge hidden tax on society, in terms of unemployment, a less efficient economy, a huge extra health care bill, extra military and security cost to safeguard global oil supply and transport, extra cost of cleaning up spills, waste, environmental damage, and dealing with climate change and a national debt that is growing out of control as a result of all this. The two images below show two things, i.e. that gasoline prices closely follow crude oil prices and that the trend of oil prices is going up over the years. By comparison, it's much cheaper to drive on electricity. The upfront price of electric vehicles may seem high, but the cost of the vehicle over its lifetime is low compared to gasoline vehicles, when taking into account the cost of powering the vehicle, maintenance and service. Electric vehicles and renewable energy complement each other in many ways. Electric vehicles can store surplus power from rooftop solar panels and then power the house during the evening peak, all without the electricity having to travel through the grid (with associated losses). Moreover, much of the house can be powered through a 12-Volt DC wiring system, without the need for inverters changing the power to higher voltage AC and back (with associated losses through power adapters). Furthermore, electric vehicles can store surplus wind energy at night and feed their surplus back into the grid at times of high demand. Finally, renewable power spread power much more locally, into the hands of people, as opposed to the concentration of power that goes hand in hand with fossil fuel.